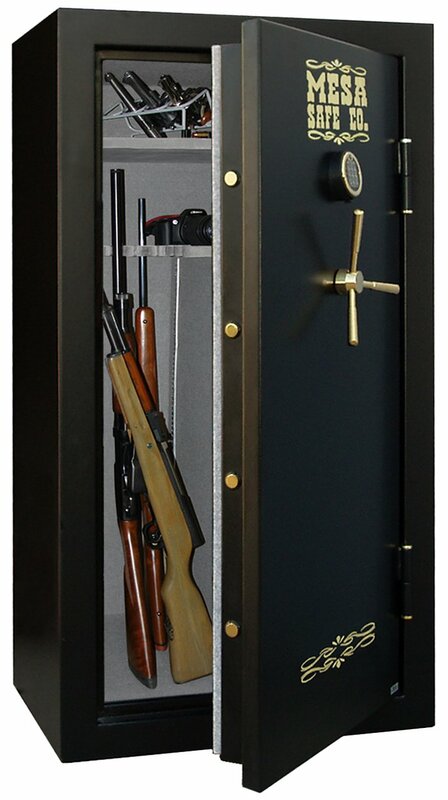 When searching for gun safes, often the choices given could be more accurately described as lockboxes. But what if you have a lot of long guns–perhaps you’re a collector—and a real “safe” is needed, an old-fashioned, vault-style, get-into-this-if you can, you’d-better-bring-the-dynamite, money-is-no-object, type of safe? If you are, there are a few companies out there catering to your needs. One of them is the Mesa Safe Company and, h, we look at one of their offerings. This safe stands 5-feet tall, is made from steel that is one and a half inches thick, and weighs over 650lbs. Once you have it in place, it is probably not going anywhere unless your local criminals bring hauling equipment, but there are anchor holes to allow further securing to the floor. Don’t be fooled by the vintage-style, spoked handle, it is for decoration only. The actual locking mechanism is controlled by an electronic keypad (battery operated) that can also be programmed with a time-delay. And what a locking mechanism. 4 live locking bolts and 3 deadbolts are each 1’ in diameter and made from solid steel while the locking mechanism is protected by drill resistant hard plate. In addition to being designed to keep thieves out, this safe is also designed to keep fire out. It has been tested in 1750 F temperatures for up to an hour. It is also claimed by the manufacturers that this safe will withstand a fall from two stories up. From the look of the construction, there is no reason to doubt this. As much as the exterior is designed to protect your valuables, so is the 4.4 cubic foot interior. The interior is padded with durable carpeting, and the removable (and adjustable) shelves are also upholstered. The shelving system allows your safe to be configured in any way you need. It can hold up to 30 long guns, or if you prefer you can lower the number of rifles, add some shelves and keep all your valuable documents and belongings in here as well. This may seem like not very many but this probably arises from the fact that this product costs. The breakdown of reviews is as follows: 19 x 5 stars; 4 x 4 stars; and 3 x 1 star. The 1-star reviews all mention the electronic keypad failing (in one case this was after owning the unit for 3 years). But it is probably worth noting that this safe does come with a lifetime warranty. There are some obvious concerns about buying this safe, but none really has anything to do with the purpose you would be buying this safe for. For example, the delivery included in the standard purchase of this safe is for curbside only. When this behemoth arrives, you’d better have paid the extra cost to have it moved into position in your house, or you better have asked several very strong friends to help you. Because of this, it is also awkward (to say the least) if you are unhappy with the product and want to return it. And you’d better be sure about your purchase. Having said that, this is a safe that is designed for one purpose only . . . security. And it fulfills that purpose admirably.